We offer informal diagnostic testing for ages 0-2 years of age, which is a screening of your child’s skills based on your concerns as a parent. Following the screening, we will provide verbal feedback, ideas and suggestions to improve upon any concerns that may get detected during this screening process. We may also suggest other types of evaluations from different medical professionals or education professionals that may help your child. We offer full diagnostic testing, which is using age-norm data and play-based observations to help determine if your child has a delay in an area of development. You will receive a full write-up with recommendations and treatment goals, a parent consultation to review the results, and a classroom observation if necessary. 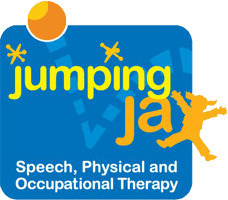 All therapy at Jumping Jax is structured play based sessions with a ratio of one clinician to one client.